When I first picked up this book, I was anticipating a coffee-table book full of pictures with accompanying text, and much to my delight what I found was a compelling story of a community. A community of dolphins. The book almost doesn’t focus on the dolphins per sé – of course there is the obligatory scientific and identification stuff in the beginning – but rather the book focuses on our interaction with New Zealand dolphins. Our historical interaction; our current interaction; and the potential (or not) of future interaction. The dolphins are the centre, and focus, of this book, but the main characters seem to be those that interact and care and spend their energy protecting them. From the Cook Strait ship masters who enjoyed almost ritual interactions with Pelorus Jack in the early twentieth century; to the children who nearly half a century later played with Opo in the Hokianga Harbour. From treasure hunter and ecologist Wade Doak who spent years swimming and communicating with dolphins; to Dr Ingrid Visser who will jump on a plane after a single phone call to help a team of dedicated individual rescue beached Orca. Many people, like Ingrid, have dedicated a lifetime to helping dolphins and this book is about them as much (maybe more) than the dolphins. The human interaction with dolphins in Aotearoa started long before Europeans landed in Aotearoa – Maori have always respected and revered the dolphins. Interactions, of course, increase significantly as we take to the water; and the faster we go, the more likely we are to be accompanied by a dolphin riding the bow wave. That we may have these interactions in the future is not necessarily a given and Raewyn challenges us to transfer our passion for these highly intelligent and social creatures into a call for action. It is hard to imagine that one of these species (Maui’s dolphin) is nearly extinct. Although conservation is at the heart of this book, it never gets in the way of a captivating story. 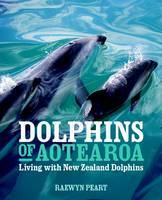 This entry was posted in Book review and tagged Craig Potton Publishing, dolphins, dolphins of aotearoa, Gillian Torckler, maritime, maui's dolphin, non-fiction, raewyn peart by booksellersnz. Bookmark the permalink.